Hearing from a girlfriend that there was a Beard Papa's in Edmonton, I got really excited. I've had cream puffs from Beard Papa's in Vancouver, my boyfriend has had them both in Vancouver and Shanghai... and we were both super excited to try them out now that there was one at West Edmonton Mall, in Phase One, tucked in a slow traffic area across from McDonald's and close to Galaxyland. There was a big sign outfront saying all cream puffs on tuesdays are $2 vs being closer to $3 regular price. The unfilled cream puff pastries were arrayed on the counter under a display case, with metal cannisters that pump the cream puffs full of custardy goop in the background. There are a few flavors to choose from - original, mango, green tea, and a few others. We stick with the original vanilla custard, and get an eclair to round things out. 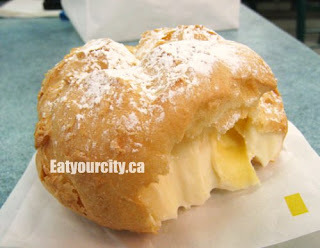 The exterior of the fist sized cream puff was flaky but strangely quite dry and not tender-flaky as we expected. The filling wasn't mixed well.. our first cream puff had a nice distribution of vanilla specks and flavor, though it had an odd stripe of yellow in it. The filling was more of a custardy pudding texture than a custard cream but it was nice and cool. 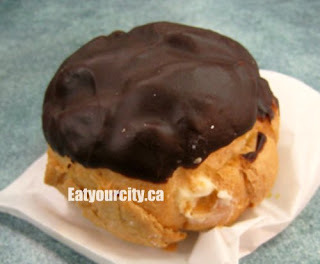 Essentially the same cream puff but covered in a thick layer of dark chocolate, with the layer of chocolate adding in a nice hit of rich chocolate as it melted on your fingertips as you bit into the cream puff. The filling in the eclair was sadly underflavored, with hardly a vanilla speck to be seen, and tasted like a very light bland pudding instead of a vanilla-y custard. This is great! Cream Puffs are making a come back! They're soo good, and light and airy, it feels like eating nothing!! :) Trick the mind, I guess! Just tried the Edmonton location Beard Papa's this past weekend, and I am sad to report that I have similar comments as Nomnomnom. Compare to the Vancouver and San Francisco locations, the product at Edmonton's branch is definitely not living up to the brand name. The eclair that I got has no cream custard flavor, I couldn't even find any vanilla speck in the custard. The whole cream puff including the chocolate topping was frozen. It is a rare occasion for me to not finish any dessert, but I can't even consume more then three bites of this eclair! Really disappointing as this is the closest Beard Papa's location and yet their product is not up to the standards of other stores.